Not going to waste my time on that one... Never liked that particular light tank... Not really a tank IMHO as much as it is more like an armored tracked vehicle with a a decent infantry support cannon..
Gosh, makes you wonder, I know if Tamiya were to poll all the members in this forum, the Sheridan would have made last on the least! I would have thought the next tank were to be a centurion, Cromwell, M60, hell even a firefly as they would be able to re-use alot of the tooling..
Tamiya, if your listening, make a Merkava III or IV I will take two!!!!!!!! To be honest Mr Front. I believe that any new armour Tamiya brings out will more likely come out in 35th scale first, then they watch its popularity through sales, due to the higher cost of larger tooling, if it doesn't do well in 35th world wide, the sad truth is that it's doubtful it will be produced in 16th. It is being produced in 1/16....Fyi. Eastern Front wrote: It is being produced in 1/16....Fyi. Sorry, didn't mean the Sheridan. I was talking about any other armour like you mentioned that you would prefer them to produce in 16th. 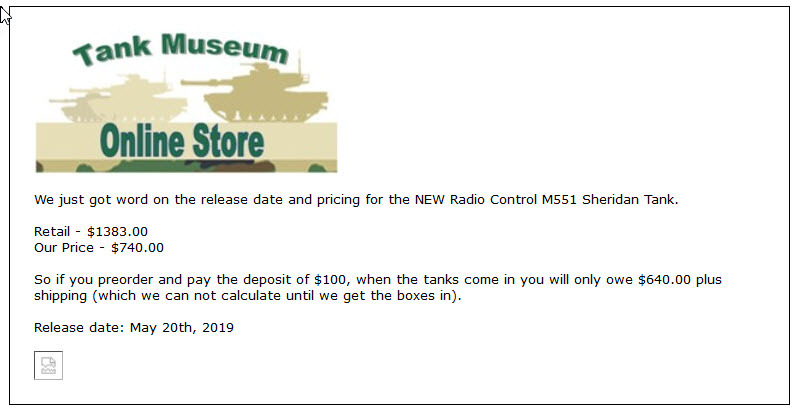 I too would love them to produce a centurion, would also love them to produce their 35th Matilda in 16th, I would be more inclined to purchase a Tamiya for the later. I was just mentioning the sad fact why Tamiya are so slow at introducing newer armour offerings in 16th. Eastern Front wrote: Not going to waste my time on that one... Never liked that particular light tank... Not really a tank IMHO as much as it is more like an armored tracked vehicle with a a decent infantry support cannon..
At least it is something we have not seen before, not another T34 or Tiger. Coming out a couple of month after their newly tooled 1/35 M551, I hope it is of the same quality, and that it comes with crew figures. But I agree than an M48 or M60 would have been better and would have allowed far more variants. Looking forward to making some NTC VISMODs. I am happy to hear this! I have always like the Sheridan and have been collecting data to do a scratch built version. WAS planning on starting with the M41 drive with a scratched upper and turret, now it just got a whole lot easier. It should be interesting to see how they "pack all the electronics in as the turret does not offer much room. Tamiya 56043. Looking good. I am happy to see a Vietnam era US tank crew figure. Just received this and had to take the plunge. $780.08 USD including shipping. And a Leopard, Centurion, M48, T34/76, Firefly, T55 and a 1/6 M4A2; so what's one more? Not sure of the differences between the two. Usually, there would be a static and a RC versions. I WILL finish the Abrams before starting ANY THING else. I'm not sure either, the Pre Order at the AAF Museum is for the 56043 Full Option Kit.